Around 8 AM on August 5, 1936, Nathan Berlin, an employee of a nearby lumber yard, saw an old black trunk wrapped in rope in a vacant lot, near 701 Court St., in Red Hook, Brooklyn, within earshot of the Gowanus Canal. Curious about the contents, Berlin opened the trunk, then called the police. Inside the trunk was William Hessler, 31 years old, “5 feet 3 inches tall, dressed in brown trousers with a white pencil stripe, new white shirt and brown shoes. There was a plain gold band ring on the small finger of the left hand.” (The New York Sun, August 5, 1936, p.10). He had been dead for eight to fifteen hours. Hessler was “stabbed 48 times with an ice pick and tied with a clothesline.” Initially the police thought that he was shot. The stab wounds, forty were near the heart, were discovered by the assistant medical examiner. Hessler was identified by the police from his fingerprints. In the few years before his death, Hessler was arrested twice, for extortion and kidnapping, but not convicted. It was believed that the killers were going to dispose of the Hessler-filled-trunk in the Gowanus Canal but were interrupted and deposited Hessler-in-a-trunk in the tall grasses growing in a vacant lot. As police processed and investigated the trunk (after Fellig made his self portraits) and surrounding area for evidence, finger and foot prints, it began to rain. Pleasant thought: Did you know that when underworld gang members leave a corpse in some convenient trunk on a dump, as they did with William Hessler, small time Brooklyn extortioner, they leave a nickel with it for carfare across the river Styx. Brooklyn Daily Eagle, August 18, 1936. 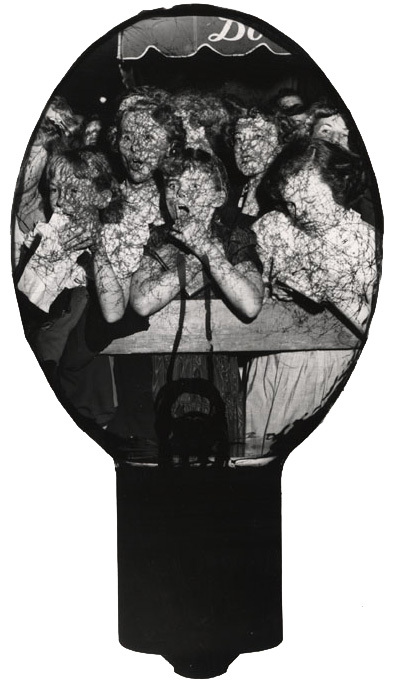 This entry was posted in Fans in a Flashbulb and tagged 1937, Brooklyn, gif, LIFE, Manhattan, New York, New York City, onthisday, onthisdayinhistory, photojournalism, Red Hook, self portrait, selfie, Weegee. Bookmark the permalink.